A power room inside the SUPERNAP campus in Las Vegas. Switch today confirmed plans for a $5 billion Michigan data center campus. Today we provide a look inside the Top 10 Cloud Campuses, the places where the cloud resides. Cloud campuses is our term for the sites where technology titans concentrate massive amounts of computing power in multiple data center facilities. These huge campuses are where the cloud lives – the physical manifestation of the Internet, often located in rural areas offering cheap land and power. Data center hubs enable companies to rapidly add server capacity and electric power, creating economies of scale as more workloads migrate into these massive server farms. Nobody builds bigger than Switch, the creator of the massive SUPERNAP campus in Las Vegas. The original SUPERNAP was a pioneer in hyperscale computing, spanning more than 400,000 square feet and featuring the design vision of Switch founder Rob Roy. Innovations in airflow containment and multi-mode cooling helped establish the SUPERNAP as a leading destination for high-density computing, supporting workloads up to 1,500 watts per square foot. Switch has added two more huge SUPERNAP buildings, expanding the campus to more than 1.4 million square feet of data center capacity. At full build-out, the Vegas campus will support 280 megawatts of IT capacity. Although its primary business is colocation, Switch has become an increasingly important player in cloud computing, with more than 120 cloud or managed service providers as customers. Even bigger cloud campuses lie ahead. Switch has announced plans for a 2 million square foot campus near Grand Rapids, Michigan and a 6.4 million SF development in Reno that will be the world’s largest data center campus. Google has been the first mover and leading innovator in hyperscale computing, building a series of data center campuses around the world to support its massive Internet business, which now spans search, advertising, cloud computing and a growing constellation of emerging technologies. The company now spends more than $2 billion every quarter on its data center infrastructure, and the largest chunk of that spending has been focused on a former field in Iowa that is being developed into one of the world’s most massive cloud campuses. Google plans to spend more than $1.5 billion to build Internet infrastructure in Council Bluffs, a city of 62,000 nested along the Missouri River, across the river from Omaha, Nebraska. Google’s selection of Council Bluffs has sparked a data center boom in Iowa, where Facebook and Microsoft are also building huge cloud campuses. Greenpeace estimates that Google has deployed 105 megawatts of capacity in Council Bluffs. Most of Virginia’s major cloud campuses are focused on the data center cluster around Ashburn in Loudoun County. Microsoft has plenty of servers in Ashburn, but even more in a hyperscale cloud campus in Boydton, a tiny town of about 400 residents near the North Carolina border. Microsoft has been rapidly expanding its cloud capacity around the world, and its southern Virginia campus is a showcase for the company’s data center design, which allows it to expand in phases. The Boydton facility features the use of a container-based design known as an IT-PAC (short for Pre-Assembled Component), the centerpiece of a modular, component-based design that offers cost-cutting opportunities at almost every facet of the design. The modules operate in all environments, and cool servers with fresh air that enters through louvers in the side of the container – which effectively functions as a huge air handler with racks of servers inside. Microsoft started work on the southern Virginia campus in 2011, and has since announced four expansions, with a total investment at the site of $1.7 billion. On the high plains of central Oregon, a revolution has begun in open source hardware. The Facebook data center campus in Prineville was the genesis of the Open Compute Project, in which Facebook designed custom server, storage and data center designs and freely shared them with the world. The Open Compute movement has been a disruptive event in the server world, where cloud designs grab a growing share of the market. But Prineville (Pop. 10,000) is also the cornerstone of Facebook’s global Internet infrastructure, which supports more than 1.5 billion users. The campus in Prineville features two huge data centers, each more than 300,000 square feet in size, as well as several of the company’s “cold storage” facilities for long-term backup of lightly accessed photos. Facebook recently announced plans for a third major data center in Prineville, which will be its largest yet at 487,000 square feet. The Facebook cloud campus has been a boon to the local economy, as the company has invested more than $780 million at the site and attracted other tech companies to the region – including Apple, which is building a cloud campus of its own just up the road. Developer DuPont Fabros Technologies likes to build big, and that strategy has paid off in Ashburn, Virginia, where the company’s Ashburn Corporate Center (ACC) cloud campus houses more than 1.6 million square feet of data center space, spread across six huge buildings – including several that are more than 1,100 feet in length. The ACC campus was launched in 2007 to provide large footprint “wholesale” data center space next door to the Equinix interconnection facilities. DuPont Fabros’ approach has won over some of the largest Internet players, including Microsoft, Rackspace and Facebook, which leases more than 40 megawatts of capacity at the ACC campus. These companies represent the new breed of “super wholesale” users than can build their own data centers, but have opted to lease server space, swayed by the economics of buying versus building. DFT and its customers have invested more than $1.2 billion in infrastructure in Ashburn. Digital Realty is a data center colossus, and the largest player in the multi-tenant market, with more than 24 million square feet of technical space in 30 markets around the globe. It has built major cloud campuses in major markets, including Dallas, Santa Clara and Chicago. The largest is in the heart of Loudoun County’s “Data Center Alley,” where the Digital Ashburn campus houses 1.5 million square feet of data center space in eight buildings to support tenants like Amazon Web Services, LinkedIn and major financial service providers. A ninth data center is under construction, and once that’s filled there’s room for a 10th building. Digital Realty has invested $950 million in the first eight facilities, and will spend another $300 million to complete the final two buildings. The company recently announced plans to build an additional 2 million square feet of data centers on a new cloud campus on adjacent land in Ashburn. The National Security Agency’s huge data center campus in Bluffdale, Utah has been the object of fascination, serving as a lightning rod for the NSA’s controversial surveillance and data storage practices. The NSA will spend up to $1.5 billion on the Utah data center, which has a power capacity of 65 megawatts. The 1 million square-foot facility in Bluffdale, Utah is believed to operate advanced high-performance computing infrastructure harnessing advanced data center technologies. The agency has arranged to have up to 1.7 million gallons of water per day available to cool the huge facility, but was using far less than that in its early months of operation, according to Utah media. The NSA Utah Compute Facility doesn’t host any public cloud services (that we know of), but represents the frontier of America’s intelligence and cybersecurity capabilities. As such, it is relevant to any discussion of the top computing campuses. Loudoun County is home to more than 60 data centers, with 6 million square feet of data center space and another 3 million square feet in the pipeline. Many of those data centers seek to be close to an Ashburn cloud campus operated by Equinix, which provides interconnection services for networks and content companies. 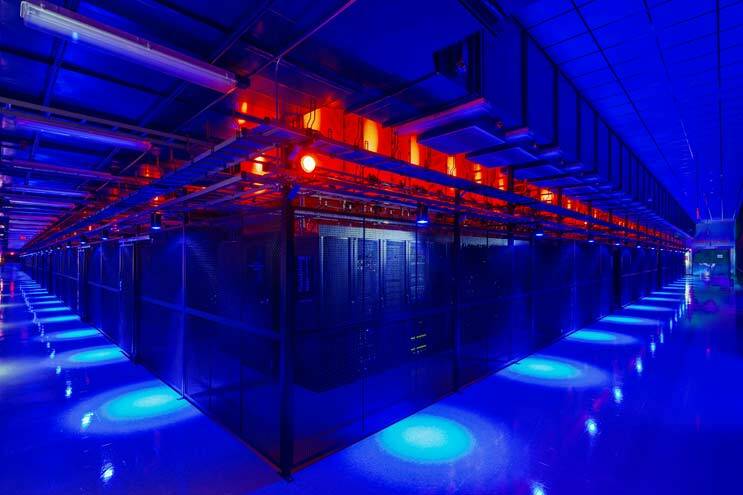 Equinix built its first data center in Ashburn in 1998, providing a “carrier-neutral” facility offering access to Internet backbones. The Equinix campus quickly become the Web’s busiest meeting place, with 10 buildings and nearly 500,000 square feet of colocation space in which more than 200 networks connect. As Equinix has grown, the land around its Ashburn campus has become some of the most strategic data center real estate in the world. The company has run out of room on its original campus and on Oct. 15 broke ground on a 40 acre parcel that will be home to five new data centers. Equinix expects to invest at least $1 billion on its North Ashburn campus over the next 10 years. Apple was a latecomer to the cloud campus party, operating a relatively small data center footprint until 2009, when it announced plans to invest $1 billion in a data center in Maiden, a small town in western North Carolina. It has caught up in a hurry, and now has campuses under construction in Oregon, Nevada, Ireland and Denmark to provide the global infrastructure powering its iTunes and iCloud services. The original iDataCenter in Maiden spans 500,000 square feet, and is now supported by a smaller “strategic data center” using modular infrastructure. Apple’s North Carolina operation is distinctive for its on-site energy infrastructure, including two massive fields of photovoltaic solar power arrays, and a deployment of Bloom Energy Server fuel cells. As the largest player in public cloud computing, you’d expect Amazon to make our list. Indeed, Amazon has a large armada of cloud server farms, distributed in data center clusters. These clusters are spread across multiple smaller sites rather than a single huge campus, so Amazon doesn’t rank as high as it otherwise might. This approach is driven by Amazon’s use of Availability Zones, which allow customers to run instances in several locations to avoid a single point of failure. Availability Zones must reside in separate data centers that are isolated from one another, but close enough for low-latency network connections. The largest of these clusters is the US-East region, which spans more than 20 data centers in Northern Virginia, spread across Sterling, Manassas, Chantilly and Ashburn, where it has several multi-building campuses. Wonder how we compiled this list? Read about our methodology. Click here to access the full-version of the article, The Top 10 Cloud Campuses, which originally appeared on Data Center Frontier on November 23, 2015 and was written by Rich Miller.